As the album title implies, this third outing by guitarists Kevin Kastning and Mark Wingfield is a brooding, somber affair. Kastning's choice of chords has an angular, ominous feel while Wingfield's electric guitar uses much more sustain with long, piercing feedback squeals. For the uninitiated, this duo plays improvised instrumental guitar sketches - Kastning on a battery of custom-made acoustic guitars, Wingfield embellishing on electric with a hex pickup that triggers various synths. Kevin's arsenal for this release includes 30-string Contra-Soprano guitar, 17-string Contraguitar, 12-string extended baritone guitar, and 12-string alto guitar. He plucks, scrapes and strums gloomy chords while Mark hovers overhead, firing rapid single-note accompaniment with menacing, synth-triggered feedback that hangs in midair for an eternity. There's a bit of cat-and-mouse with one chasing the other, but the duo's intuitive synchronization is palpable. What makes them unique is a knack for melding unorthodox chording with snaky leads, as if these pieces were thoroughly rehearsed. The disc's dark mood honors the spirit of late composer Elliott Carter, a major influence on both musicians. Dark Sonatas is named as one of the Best Albums of 2013 by Acoustic Music. Kind of reassuring, isn't it?, that in these strange times of turmoil and deception, some are working to keep us in what nourishes mind and soul, even if they're the deeper recesses of those faculties. Dark Sonatas is the latest web of brooding spontaneity from Kevin Kastning and Mark Wingfield, and we find that Mr. Wingfield has adapted ever more appositely to Kastning's Gothic thinkery and with increasingly surprising agility. It's not easy to mentate thusly, yet he fits like hand in glove, and the two continue their previous terrain with newer and more obscure, yet just as bizarrely delineated, wrinkles. It turns out that Elliott Carter (the guy lived to 104! : born in 1908, passing away in 2012) was a prime inspiration this time out, though, in Kevin's and Mark's hands, it sounds more like Carter sieved through Blomdahl, Penderecki, and Sharrock with a touch of Fripp's wilder shores in Evening Star, what with the strange electronic oscillations, slurs, feedback, and such emanating from Wingfield's electric. Kastning remains rooted in his acoustic axes and has again increased his soundfield with the new 30-string contra-soprano guitar flanked by a trusty standard arsenal: 16-string Contraguitar, 12-string extended baritone guitar, and 12-string alto. Contrapunctus Opscurum I hits some sardonic and even cartoonishly arch notes as the freeform dialogue progresses, bending the milieu into surreal Tex Avery-esque malformations amid Dalinian meltscapes and Venosan grotesqueries. Illustratio Triocha II gets even more out of hand, slidey and spacey with leashed distortions and elastic wormholes. Pure chaos is never a factor, that's for the free jazz crowd, this is much more in the way of neoclassical (Carter again!) and post-neo: form with function with essence, guided by Nature and mind, transcribing imagination into already exotic structure, not the dance of a mad Kali. As ever, throughout Kevin Kastning's impressively increasing catalogue, this is not music for your grandmother or The Zombie Nation tuning in Oprah and Phil but rather, running back to Fripp again, mobile intelligent units athirst for rescue from the stultifying realities of an Earth going progressively more Orwellian day by day. And here's a very nice little tidbit directly from Kevin to me to you, the FAME website readers: he intends on issuing a solo disc this year, and that should be VERY interesting indeed, hinting at qualities kinda like Philip Glass' Solo Piano CD in its own way. "I was just listening to your CD with Mark again. Deep stuff. It's a great album!" The world of experimental 20th century music is well over a century old. 20th century recording artists such as Edgard Varese, Luciano Berio and Wendy Carlos changed the way many music fans listened to music and although the 20th century is long gone, there’s no turning back from the breakthroughs of music history. Another name familiar to most 20th century experimental music fans is Elliott Carter, who is perhaps metaphysically the subject behind Dark Sonatas, the 2013 CD from guitarist Kevin Kastning and his U.K. counterpart and fellow guitar collaborator Mark Wingfield. Known by astute music followers as the head of Greydisc Records, Kevin Kastning is not only a musical experimenter but he’s also the inventor of many guitar breakthroughs, including (but not limited to) the 30 string guitar, which he implements to great effect on the Dark Sonatas CD. In contrast to Kastning’s 30-string guitar styles, Mark Wingfield, on the other hand is an electric guitar practitioner in the spirit of Allan Holdsworth. If Miles Davis played electric guitar he might sound like Mark Wingfield. Thankfully, both guitarists are in top form on Dark Sonatas, which according to the CD liner notes is greatly impacted by the recorded works of Elliott Carter. It’s quite interesting to note that Dark Sonatas was recorded between November 6-8 2012, one day after Elliott Carter passed away on November 5th, 2012. From the sound of things, do you think Wingfield and Kastning were channeling Carter’s sonic seasonings? It’s fascinating to note that for an album as unusual and experimentally challenging as Dark Sonatas, there’s hardly a note out of place here. Unlocking a number of sonic covenants, Dark Sonatas is actually the second album on which Kastning used his 30-string guitar (the first was the album Nowhere, Now Here with Carl Clements) and the depth and breadth of the guitar sounds from both players is quite ear-opening. Featuring 13 tracks that clock in at 62 minutes, Dark Sonatas is quite dynamic in places yet for the most part, the mixing and mastered CD sound offers a clean and pristine soundscape. Experimental electric and acoustic guitar recordings have been quite popular since the 1970s days of messers Fripp, Frith and Holdsworth. Even so, on Dark Sonatas, Kastning and Wingfield bring the art of 21st century experimental guitar recordings to a whole new level of sonic excellence. 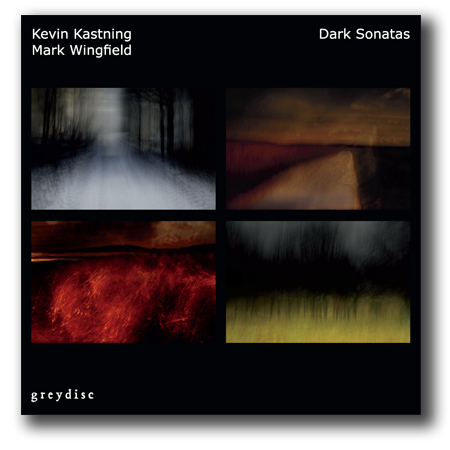 KEVIN KASTNING - MARK WINGFIELD/Dark Sonatas: Not only is Kastning one of the greatest guitarists working today, he's one of the most fearlessly prolific as well. Just a few months after releasing another of his other duets, he's back again with a new duet with Wingfield, hardly seeming like it's been a year since the last time these guys went at it. A wild set where you don't realize there's only two of them raising such a racket, this is sort of minimalist and just shoots past all the regular sign posts your would judge this against. For the jazz lounge eon Pluto, this set is a mind bender that may or may not be from outer space. Wild stuff that takes the 30 string guitar to places you haven't thought about yet. A must for the musically fearless. "Congratulations for your new album with Mark. At last I had time to listen to the entire album. This is quite different than the previous albums, and your playing sounds very cleaned musically. Your improvisations are much structured than before. Very nice work! Mark is great as always. The sleeve is very tasty and I especially like the titling. All in all this is a great album and I am very proud on you! The new album is really great and it is really different in its conception than the previous albums." I enjoyed previous collaborations between you and Mark but felt almost a point counterpoint type relationship between the acoustic and synthesized electric guitar voices. Not a bad thing but almost more like a conversation than the Aural landscape I feel I'm being transported into in this CD. You and Mark seem more integrated in this album. My emotional response to this piece is akin to what I'd feel in a real journey. Previous pieces I was more aware of the interaction.... listening not only to a phrase or passage from you or Mark but then wondering what the response would be. An interesting interaction but I find my response to this to be very different. I find I am more transported and less aware of independent voices or interactions. Experiencing an emotional journey rather than engaging in an intellectual conversation."